Whether it’s books or television, true crime is a hot genre. People are drawn to cases of murder and mayhem and soak up anything written or televised about it like a dry sponge – myself included (obviously)! But just because these folks are long gone and their crimes all but forgotten, it doesn’t mean we can’t dredge them up again – right? 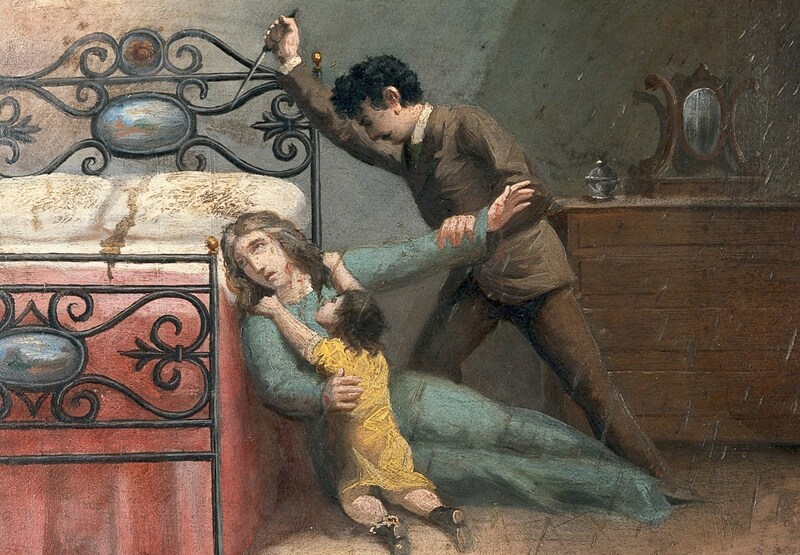 During the Victorian era, out-of-wedlock births were considered extremely distasteful and enough to make a mother an outcast of society. But that didn’t stop Mary Alice Livingston from doing it four times! And all of them had different fathers. For shame! Few mothers worked during this era and single mothers like Mary Alice struggled to survive. If not for the graciousness of her stepfather, Mary Alice would have been destitute. As it was, she struggled to support the children financially. When Mary Alice became pregnant with her fourth illegitimate child, her stepfather informed her his support was coming to an end. Mary Alice was outraged, feeling she was entitled to the money as her father, who had passed many years before, had left a sizable estate that she was to inherit upon her mother’s death. But Evelina Bliss was in pretty good health and Mary Alice need the $50,000 now. 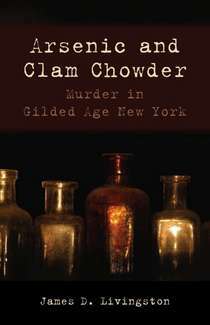 So… On the evening of August 30, 1895, Mary Alice ordered clam chowder from the dining room of the Colonial Hotel where she lived with her children. When it arrived, Mary Alice laced it with arsenic then sent her daughter Gracie and a friend to deliver it Evelina. By nightfall, Evelina was deathly ill. 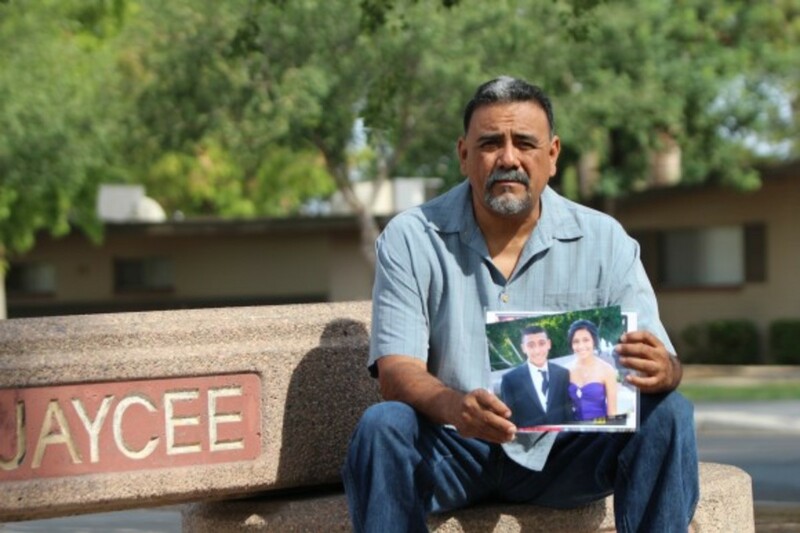 When the doctor arrived, Evelina told him she believed she had been poisoned by her daughter. And when Evelina passed away just an hour before midnight the same evening, the doctor tested the chowder and found the poisoning. Mary Alice was arrested while attending her mother’s funeral and held in New York’s “tombs,” where she gave birth to her fourth baby but was allowed to keep him in her cell while awaiting trial. Mary Alice was allowed to use some of her inheritance to pay her legal fees. Her defense played on the unwillingness of New Yorkers to sentence a woman, especially a mother of four young children, to death. And it worked – Mary Alice was acquitted of the charge of murdering her own mother. The young woman of ill-repute lived out the rest of her life in relative anonymity in Manhattan, with the last years being ones of poverty. She died in 1948. Mary Alice’s cousin thrice removed James D. Livingston released a book titled Arsenic and Clam Chowder in July 2012, which chronicles the trial as well the background of Mary Alice and her New York socialites family. His book is compiled from old court records, personal research, interviews, and much more. And it’s complete with reproductions of very old photos, making it one of the best historical true crime books you’ll ever read! In 1926, 13 year-old Canadian Sanford Clark was sent to live with his maternal uncle Gordon Stewart Northcott in the area formerly known as Wineville, California (now part of Los Angeles). During his time in America, Sanford was subjected to horrendous physical and sexual abuse by his uncle and grandmother, Sarah Louise Northcott. The young boy was also forced to help his uncle kidnap three other young boys brought to the farm to be beaten, molested, and murdered. Sanford was then made to help bury their bodies in quicklime. In 1928, Sanford’s older sister Jessie came to visit her brother and Sanford told her all of the horrific things that had happened during his stay with Uncle Gordon. Jessie managed to keep Sanford’s secret until her planned departure a week later then, as soon as she was safely back within the Canadian borders, she promptly wrote to the American consul about the murders and her brother’s suffering. Upon receipt of the letter, The American consul forwarded it to the Los Angeles’ Police Department (LAPD). The LAPD, having concerns about immigration issues, contacted the United States Immigration Services who finally went to check out the claims on August 31, 1928. When Northcott spotted the agents, he fled through a back field but not before he told his nephew he’d better stall the agents or he’d shoot all of them from the treeline. Sandford, fearing for his own life and the agents’, did as he was told and managed to stall them for at least two hours but, once he felt safe, he told them everything and a massive search of the farm began. Searchers never unearthed complete bodies, but they discovered personal effects of three missing children, a blood-stained ax, and partial body parts – including bones, hair, and fingers near the chicken house; hence the case became known as The Wineville Chicken Coop Murders. Northcott and his mother were apprehended in their native Canada in September 1928 and extradited back to the U.S. to stand trial. Back in America, Sarah Northcott pleaded guilty to the murder of Walter James Collins, Jr., a nine year-old who was abducted from his Lincoln Heights home in March 1928. Despite public opinion otherwise, Sarah claimed her son played no role in this murder and, as such, Gordon was never charged with the crime. On February 8, 1929, following a 27 day trial, Gordon Northcott was convicted of murdering 12-year-old Lewis Winslow and his 10-year-old brother Nelson Winslow as well as an unidentified son of a Mexican migrant worker. The following week Northcott was sentenced to death and was hanged on October 2, 1930 at San Quentin State Prison. Sarah Northcott was sentenced to life in prison, but served only twelve years before being paroled from the Tehachapi State Prison. She died in 1944. After the trial, Sanford Clark returned to his family in Canada. Serving in World War II, Sanford was married to his wife June for 55 years, adopted two sons, and retired from the Canadian postal service after 28 years before his death on June 20, 1991 at the age of 78. 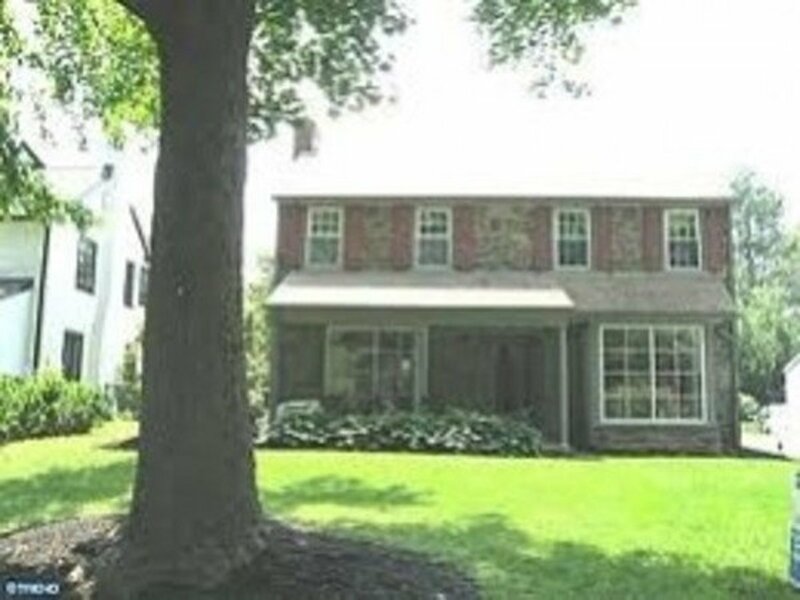 The story of Gordon Northcott and the abduction of Walter Collins regained new interest when Clint Eastwood produced a movie titled Changeling which aired in theaters during 2008. 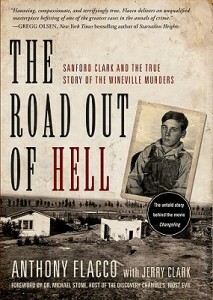 In November 2009, author Anthony Flaccopublished The Road Out of Hell which provided an in-depth recounting of the case with the help of Jerry Clark, Sanford’s oldest son, and is so descriptive readers will find themselves experiencing a range of emotions from fear to relief, heartbreak to utter joy. I do not recommend reading it without a full box of Kleenex handy! It all began in 1901 when Amy Archer and her husband James were hired to care for an ailing widower named John Seymour in Newington, Connecticut. When he died in 1904, his heirs turned his home into a boarding house for the elderly and the Archers were allowed to stay and operate the home. Sister Amy’s Nursing Home for the Elderly provided care to senior citizens until the Seymour heirs decided to sell the house in 1907. The Archers moved to Windsor and used their savings to purchase their own home which was promptly renovated to become The Archer Home for the Elderly and Infirm – expanding their business by permitting more than just the elderly but the sick and handicap as well. Residents of the The Archer Home paid a rate of as low as $7 per month, depending on their age and needs, or a one-time lifetime fee of $1,000; quite a hefty sum at the turn of the 20th century. At Amy’s urging, most patients paid the lump sum payment. The Archer Home was very popular. Unfortunately, Amy had not thought through her business plan and soon found herself with a full house. The monies paid had been exhausted and Amy was still obligated to provide care for her residents. To Amy, this was simply unacceptable and she began to think about ways to open beds, do less work, and make more money. The year 1907 would began a decade of mysterious deaths at The Archer Home. Twelve residents died between 1907 and 1910 alone. Then in 1910, just weeks after Amy had taken out a life insurance policy on him, her husband James died of seemingly natural causes. The coroner declared his death to be a result of kidney disease; not unreasonable since James was known to be a heavy drinker. In 1913, Amy married wealthy widower Michael W. Gilligan but on February 20, 1914, this second husband died of (officially) severe indigestion. Although Gilligan had four adult sons, a Will left his entire estate to Amy. Forty-eight more residents would die between 1911 and 1916. One of them was Franklin R. Andrews, an older unmarried, but otherwise healthy, gentleman. On the morning of May 29, 1914, he suddenly fell ill while doing some gardening at the home. By the next evening, he was dead. Following his death, his sister Nellie was sorting through her brother’s personal papers and read Andrew’s notations of Amy’s requests for money. Andrews had also noted a pattern of residents dying soon after paying the large lifetime fee to their hostess. Nellie took her concerns to the local District Attorney, but he dismissed her claims. Amy Archer-Gilligan had a fine reputation among townsfolk and he was certain if she was killing anyone, rumors would be running rampant. The strange deaths continued and Nellie refused to stay quiet. Realizing the district attorney was going to be of no help, she turned to another source: The Hartford Courant. On May 9, 1916, the newspaper published the first of several articles about the “Murder Factory” and, because of the publicity, an investigation by police was initiated. 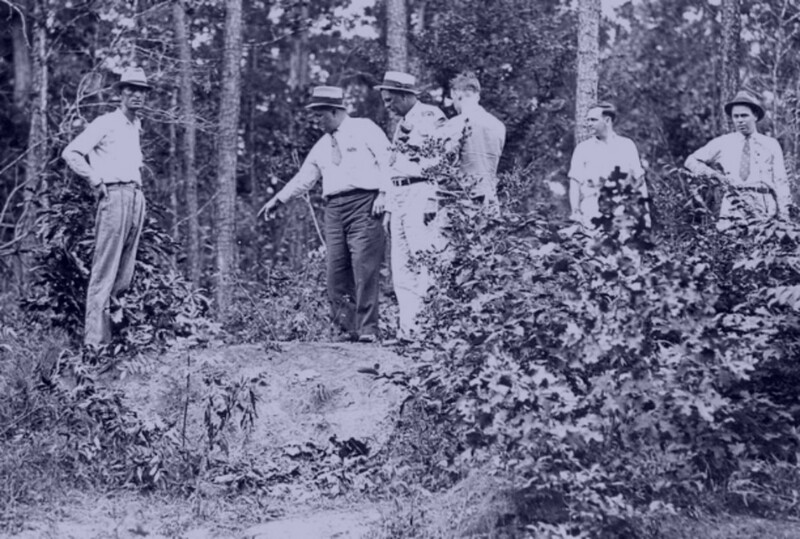 The bodies of Gilligan, Andrews, and three other boarders were exhumed and an autopsy revealed all five had died of either arsenic or strychnine poisoning. Local merchants told detectives Amy frequently purchased large quantities of arsenic in their stores, saying it was to be used to kill rats – not an uncommon method of the time. Gilligan’s children had long refused to believe their father had cut them completely from his Will and with the allegations Amy had murdered boarders, their father’s Will was challenged. A handwriting expert, after examining the Will and several other documents written both by Amy and Gilligan, declared it to be a forgery by Amy. Amy was arrested and charged with five murders but by the time she went to trial in June 1917, her attorney had managed to reduce them to one charge of murder. On June 18, 1917, the jury found Amy guilty of murdering Franklin Andrews and she was sentenced to death. However, Amy appealed the verdict and in 1919 was granted a new trial. This time Amy pleaded insanity and her daughter testified her mother was a morphine addict who didn’t appreciate the consequences of her actions. Regardless, the jury returned a guilty verdict on second-degree murder charges and Amy was sentenced to life imprisonment. Amy only spent a few years in prison before being declared temporarily insane in 1924 when she was transferred to the Connecticut Hospital for the Insane in Middleton. She remained there until her death on April 23, 1962. True crime veteran author M. William Phelps chronicles the case which served as inspiration for the Broadway play (and later film) Arsenic and Old Lace in his 2010 true crime The Devil’s Rooming House. The book has a superb ability to take readers back almost a century ago before women were allowed to vote and to sentence a woman to death was unthinkable. At the turn of the twentieth century, there were many (many) medical advances waiting to be made so people suffering from ailments such as cancer, obesity, and diabetes were reliant on alternative methods. In 1898, on the heels of a divorce, Linda Burfield declared herself a doctor of osteopathy (natural healing). Using a regimen which involved fasting, enemas, and rough massages, “Dr.” Burfield claimed she would “cure” one’s ailments. If a patient died or was not cured, Burfield claimed it was because the patient was not dedicated or their illness to far advanced. In 1902, the first of the quack doctor’s patients died from starvation. The Carver County, Minnesota, coroner tried to have Burfield prosecuted for murder but, being as she was unlicensed and therefore unaccountable by the laws of the era, was unsuccessful. Linda couldn’t be held accountable for murder, but she would find herself answering to a Court when she married West Pointe Graduate Samuel Christman Hazzard. Linda was his third wife and the alcoholic swindler hadn’t bothered getting a divorce from at least one of his previous wives. Sam was sentenced to two years behind bars for bigamy. In 1908, Linda published a book, Fasting For The Cure Of Disease, promoting fasting as a means to a cure for virtually every ailment one could think of – including cancer. She invited those wishing to try her methods to stay at the sanitarium (now complete) which she called the Institute of Natural Therapeutics – in exchange for a rather large fee, of course. Again incorporating her regimen of fasting, enemas, and brutal massage, it wasn’t long before Linda again had a patient to die in 1908. She was 38 year-old Daisey Maud Haglund. This young woman was followed by three more patients who died in 1910 and another in 1911. And there was more, but the ailed just kept coming. They included lawyers, engineers, publishers, and others who would be considered to be educated enough to see the dangers but they didn’t; even when health inspectors came to the sanitarium and tried to convince them to leave. Linda was not only charging her patients “a pretty penny” for her services, but she had taken to removing their cash and other valuables upon their death which she kept for herself. In one particular case occurring in 1909, son of a British Lord 26 year-old Eugene Stanley Wakelin had signed over power of attorney to Linda; although he did not die of starvation – he was found buried on sanitarium grounds with a bullet to his head, allegedly a suicide. When Linda contacted his family requesting money to pay his funeral costs, she learned that, despite his aristocratic roots, Wakelin was not wealthy. By this time, the residents of Olalla were coming to believe Dr. Linda Hazzard was more of a sadistic quack than a miracle healer. Stories were frequently shared about patients stumbling down from the Hazzard place, nothing but skin and bones, begging for food and help. As so, many of Ollalla’s residents took to calling the place Starvation Heights – a name still used among old and new alike today. When hypochondriac sisters Dorothea and Claire Williamson saw an ad for “the institute” in a British Columbia newspaper in February 1911, they decided this was something they must indeed try. And surely, upon visiting the doctor at her office in Seattle, Linda must have believed she had struck gold as the Williamson sisters were very wealthy. Telling the young-30s spinsters the sanitarium was under renovations, Linda checked them into a Seattle hotel and soon the sisters were subsisting on a diet of watery vegetable broth and undergoing hours long enemas and painful massages. By April, the sisters were rail thin and delirious. It was determined they must visit the Seattle hospital but before they were whisked away in twin ambulances, Linda’s private attorney obtained Claire’s signature on a document allowing for a monthly stipend of 25 pounds sterling per year to “the institute” as well as instructions placing Dr. Hazzard in charge of cremation in the event of her death. The sisters would manage to send a cryptic letter to their childhood nanny, Margaret Conway, in April but by the time she sailed to Washington from Australia it was June and Claire was dead. Dorothea, at first, begged to leave immediately but soon changed her mind and insisted on staying because “the cure” seemed to be working. Margaret stayed with her former charge and would sneak her flour and grains as often as possible. Realizing Margaret was not a patient nor a nurse for Dr. Hazzard, several patients approached her and begged for help. They claimed they had come of their own will, but were now being held prisoner. Margaret frantically contacted the Williamson sisters’ uncle in Portland, Oregon, by cable and he arrived soon thereafter and took charge of his now-60-pounds niece. Before their departure, Linda presented them with a $2,000 bill for her services and insisted they were not allowed to leave until it was paid. The uncle negotiated a smaller sum simply to get away from the doc. The British vice-consul in Tacoma urged Kitsap County authorities to do something about the deadly doctor. When they claimed they did not have the funds to prosecute, Dorothea offered to pay the costs. As a result, Linda Hazzard was charged with and arrested for Claire’s death in August 1911. Following a trial, the jury returned with a verdict of manslaughter and Linda spent two years in the Walla Walla prison. After her release, she and Sam moved to New Zeland where she again practiced her “natural medicine” and made a lot of money. By 1920, she had made enough money to return to Olalla to begin anew, sort of. Since the state of Washington had revoked her medical license, she renamed the sanitarium a “school of health” – the only real change. Several more patients would starve to death before the “school” burned in 1935. Three years later, Dr. Hazzard died after embarking on a fasting regimen to heal her own ailments. 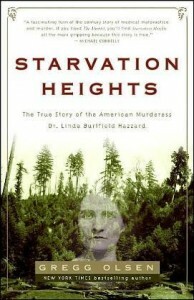 Award-winning true crime author Gregg Olsen details (really, really details) the story of Dr. Hazzard and her medicinal methods in his book Starvation Heights. It’s a fantastic book chronicling a doctor who many say was a woman ahead of own time and a must-read for historical true crime fans. Often noted as America’s first serial killer on record, Herman Webster Mudgett is well-deserving of the title. The son of an alcoholic father and devoutly religious mother, Mudgett would grow up to be a bigamist, swindler, forger, and murderer under a multitude of aliases. On July 4, 1878, Herman married Clara Lovering in Alton, New Hampshire and a son was born to them in February 1880. During this time, Herman enrolled in the University of Michigan Medical school where he stole cadavers from the laboratory, disfigured the bodies, then claimed they were killed accidentally to collect double indemnity on the policies he had taken on the deceased persons prior to stealing their corpses. By the time he graduated in June 1884, Clara and his son weren’t much more than an occasional obligation and he moved to Chicago to pursue a pharmaceutical career. Assuming the name of Herman Howard Holmes, orDr. H. H. Holmes, the name by which he would become famous, he was involved in numerous shady real estate transactions and other type businesses. In January 1887, he married Myrta Belknap in Minneapolis, Minnesota, while still married to Clara and a daughter was born to the couple on Herman’s 12th wedding anniversary to Clara. Herman lived with Myrta in Wilmette, Illinois, but frequently stayed in Chicago to tend to business. It was there during the summer of 1886 that Herman swindled an elderly widow out of the pharmacy business in which she had employed Herman to run during her husband’s illness. Soon thereafter, the widow disappeared and Herman told those who inquired that she was living in California. Herman then purchased a vacant lot across the street from the drugstore and began construction on a building featuring storefronts on of the ground floor and a hotel on two upper floors. Herman had personally designed this “hotel” with its winding maze-like hallways, windowless rooms, doors which could only be opened from outside the room, soundproof rooms, and doors and stairways to nowhere. Throughout the building process, Herman frequently changed contractors for a couple of reasons: (1) he wanted to be the only one familiar with the odd design and (2) he seldom paid the contractors’ fees – essentially having the hotel built at no cost to him. Residents of the area dubbed the building “The Castle” because of its monstrous size in comparison to those surrounding it. The hotel opened in time for 1893 World’s Fair hosted by Chicago. 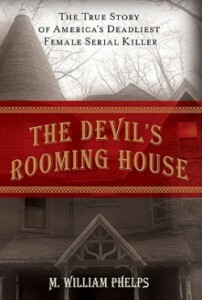 While many guests came and went from the hotel, some of them would not live to tell of the devilish innkeeper. These guests would suffer the same fate as many of his female employees, some of whom were lovers as well: tortured then suffocated either locked in a vault or by being placed in rooms with hidden spouts which piped in deadly gases. The only difference between guests and employees is that the women were encouraged to take out life insurance policies on which Herman paid the premiums and was declared the beneficiary. Once the World’s Fair was over, Herman found himself the target of many creditors so he got the heck out of Dodge. He resurfaced in Fort Worth, Texas, to claim land he had inherited from a couple of sisters; both of whom he had promised to marry and one which he had murdered. His intent was to build a second “Castle,” but Texas law enforcement wasn’t quite as hospitable as that in Chicago and Herman decided it was time to disappear – again. In July 1894, Herman was serving a short stint behind bars in Saint Louis, Missouri, when he met up with a train robber named Marion Hedgepath. Herman told Hedgepath about his idea to take out a life insurance policy on himself, fake his own death, then collect on it. For a $500 cut of the proceeds, Hedgepath put Herman in touch with lawyer Colonel Jeptha Howe who believed Herman’s plan to be brilliant and agreed to help Herman pull off the scam. Benjamin Pitezel, a drunkard with a wife and several children to feed despite his inability to maintain employment, had worked for a short time on “The Castle” in Chicago. Playing on the man’s weakness and desperation, Herman contacted Pitezel and convinced him to go to Philadelphia under the alias B.F. Perry, a new-to-town inventor, and Herman would obtain a life insurance policy on him. Herman told Pitezel he would then find a cadaver, disfigure it in an “accidental” explosion, and pay Pitezel a tidy sum for playing his role. Needless to say, Pitezel readily accepted the offer. Everything was in place just as Herman had planned but, instead of placing a cadaver in Pitezel’s place, Herman murdered the poor man instead and Herman collected the life insurance with little difficulty. However, authorities were suspicious and began investigating the alleged accident. 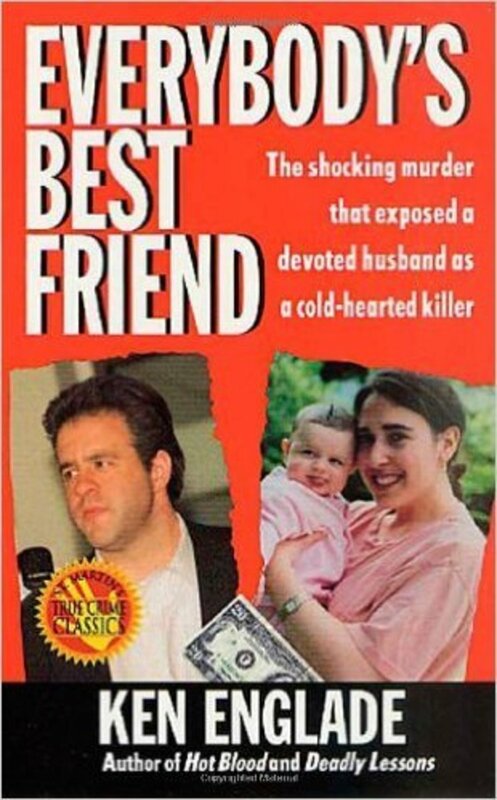 In the meantime, Herman contacted Pitezel’s widow with a story about law enforcement being suspicious (the widow was aware, albeit uncomfortable, with the scam) and claiming her husband was in hiding in South America. He then convinced her to send three of her children to stay with him as part of a plan to distract authorities. Traveling with the children across the United States and even into parts of Canada, Herman played a game of cat-and-mouse with the widow and the two children who had remained with her. Mrs. Pitezel had no idea, while she traveled a parallel route to Herman’s as part of his “game,” he had murdered her daughters, Alice and Nellie Pitezel, and their bodies had been recovered in Toronto. Philadelphia detective Frank Geyer had been on Herman’s trail since the mysterious death of Pitezel and he thought he’d located the man and Howard Pitezel in Indianapolis. A neighbor of the cottage rented by Herman had reported some strange activity at the place. By the time Geyer arrived, however, Herman was gone and the young boy’s remains were found in the chimney. Train robber Hedgepath was upset when he didn’t receive his promised commission and provided detectives with information they needed to find Herman in Boston. On November 17, 1894, Herman was arrested on an outstanding horse thievery warrant. It was all they had to hold him on while they continued to investigate the murders but served it’s purpose since, at the time of arrest, Herman appeared ready to flee the country with his unsuspecting third wife. As rumor spread about Herman’s arrest, a custodian of “The Castle” told authorities he was never allowed to clean the two upper floors and this ignited a month-long search of the place where police uncovered evidence of Herman’s murder methods and disposal of the corpses. The place once fondly called “The Castle” became crudely, but rightfully, known as “The Murder Castle” – a name it still bears today even though it mysteriously burned to the ground in 1895 and is now the site of a United States Post Office. Herman was tried for Pitezel’s murder and sentenced to death. Following his conviction, he confessed to a total of 30 murders throughout Chicago, Indianapolis, and Toronto. However, his story changed numerous times and only 27 murders have been verified. Herman was hanged on May 7, 1896 at Moyamensing Prison. And once more Karma has a funny way of setting things right: Herman’s neck did not snap immediately as is supposed to happen in a hanging. Instead, he died a slow death that found him twitching for almost fifteen minutes before he was officially pronounced dead. 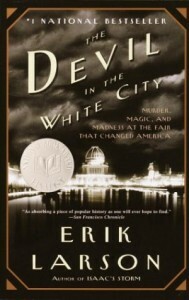 For years, author Erik Larson’s book about H. H. Holmes and World’s Fair constructor Daniel H. Burnham, The Devil In the White City, has been a best selling book at Amazon and other popular retailers. Although it’s been a while since I’ve read the book, I do recall it was a difficult one to put down!